Pumpkin pie is certainly my favorite pie, if made well. I can easily polish off half a pie in one sitting (I had a third of one today) and feel absolutely no guilt and only the slightest tummy ache. It’s so rich and spiced and smooth and creamy. It’s delicious the day it’s made when the crust is crisp and the custard has perfectly set. It’s also great the day after, when it’s sat in the fridge all night so the filling is cold and thicker. It is a great pie, and I thank the colonists for coming up with it immediately upon landing at Plymouth. 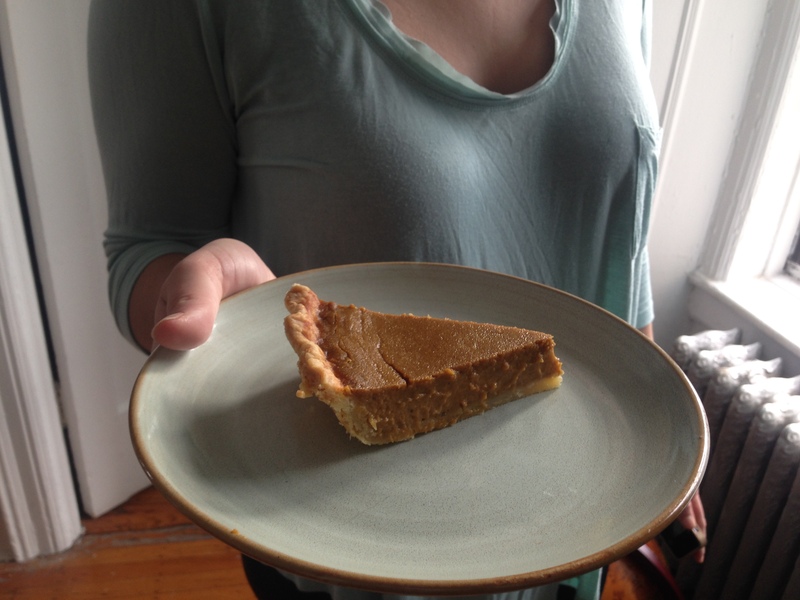 This weekend, my friend and I decided to test out a pumpkin pie recipe from 4 & 20 Blackbirds, an awesome pie shop in Gowanus, Brooklyn. Our results are only based off of our version of this pumpkin pie- I have never been able to get it in the shop as it is always sold out. Look at how puffy it is. And cracked (bad on me). But it calmed down with cooling. The pumpkin pie has brown butter to add extra nutty flavor and in order to add the butter in, you make a brown sugar caramel sauce. In the end, I felt that this distracted from the pumpkin flavor rather than adding to it, but I do really want to try their version to see where I may have gone wrong. And I’ll be sticking with my standby, the America’s Test Kitchen ridiculously difficult pumpkin pie for this year. 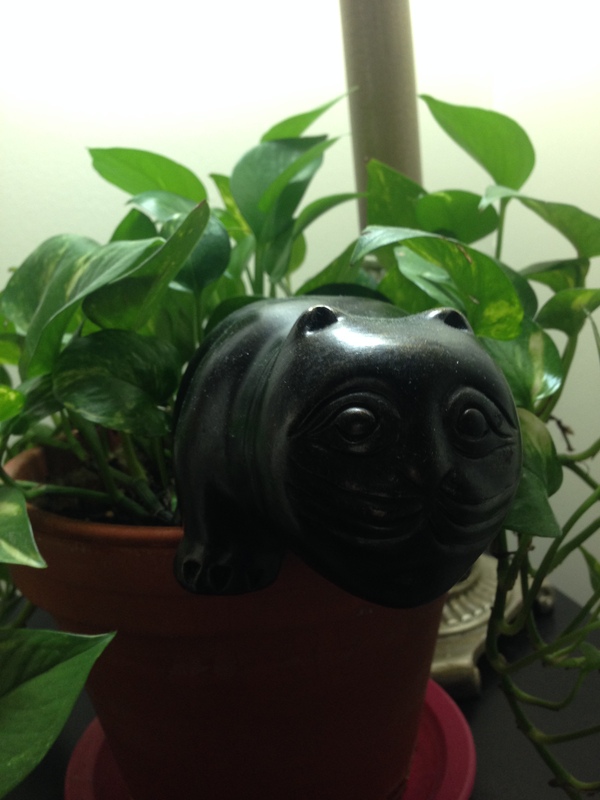 Botero cat is too fat to escape the jungle and eat pie. It is certainly an interesting pie and I recommend giving it a shot if you’re looking to experiment with this year. The spice level is solid and the custard itself came out very smooth. Make sure not to overcook the pie- it should be wobbly in the center when you take it out. Cracks in a pie (like mine had, evil non circulating oven) result from overcooking and mean the custard might separate. While the recipe calls for using a food processor to blend everything, I was fine using a kitchen aid, and probably would have been fine using a whisk. The pie only has brown sugar and molasses for sweetness, so don’t be alarmed if it’s got a darker, more mysterious flavor than you are used to. The recipe is supposed to make a 9 inch pie but we certainly had plenty of leftover filling, so an 11 inch might not be too much of a stretch. I’m feeling lazy because it is Sunday, so here is a link to the recipe rather than me re-typing it all out :). not a computer savvy person – where is the link for the recipe? 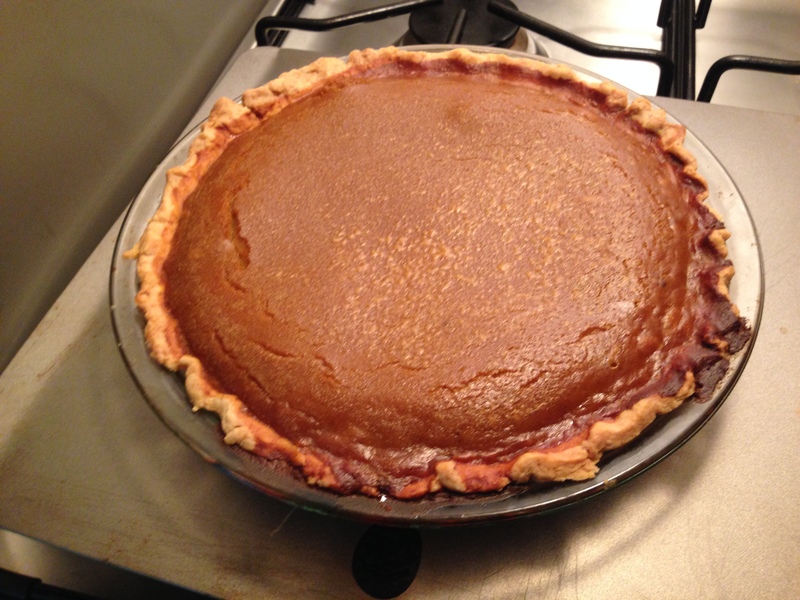 I love pumpkin pie and want to try this recipe!